Memberships, Events, Promotions/Competitions, Marketplace, Publications, Connectors/Introducers and Social Community Network, which each function within the framework of the overall operational strategy, all in line with the policies established within the Mission Statement and Vision. This can be FREE (BASIC member) or paid (ENHANCED member) with a premier level membership (for Elite Positions within Corporate and Government organisations) coming on stream. Events platform is a global place for live experiences that allows people to find and create events and sell tickets. Anyone can submits a Promotion, Competition or Special Offer which is then promoted via the various media networks including mass email to the 1000’s of members and posting across the social networks that stretch throughout the entire world. The Marketplace is used to sell products and services online to anyone in the world. Black Links United Kingdom has an online business directory and an offline version published as a business and consumer magazine. Additionally, there is a series of 6 sector-based i-themed Magazines that accompany the directory. These are stand alone Business-to-Business Publications that allow for the recognition of the leaders in the industry to be acknowledged together with all the entrants operating in that sector across the black business and consumer community. The mission of the Black Links ‘U Earn United’ Program is to connect by introduction or referral, black owned businesses, organisations and people worldwide under an umbrella that can be accessed by consumers globally and to reward those who are active in making this happen. 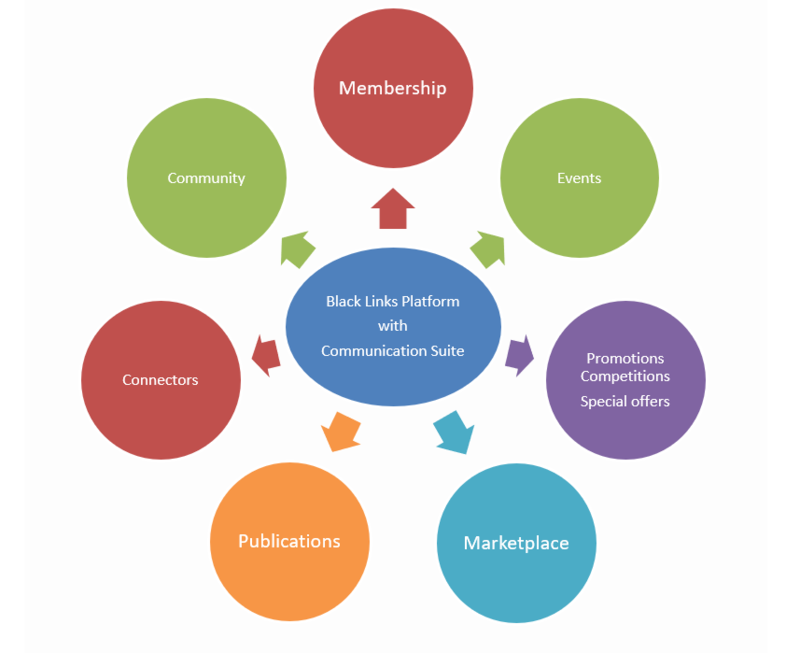 The Black Links Social Community Network allows business professionals, entrepreneurs, community champions and individuals role models to create profiles, post messages, make connections, create groups, and much more. It is a social network for the black community to talk, inform and share information and conversation. Build your business, discover articles, get advice, and receive support for your business or organisation. Board of Trustees: this is the supreme body in the co-operative and is the vehicle for expressing the spiritual, cultural, social, economical, financial, and historical will of the trust, acting in the best interests of all members. Trustees are invited to take up appointment and operate in a non-salaried capacity. Recommendations often follow previous tenure within the Governing Council. Governing Council: the representative and governing body of the co-operative. Members are elected annually. Their role and purpose is to action the remit of the trustees in accordance with the Black Links Mission Statement and keep correct compliance with accounting principles, operational processes and any other areas which require consideration. Management Council: this is the managerial and executive team that comprises the managers and managerial members, and is responsible for the executive management of the co-operatives and the overall operation and co-ordination of its business structures. Revenue and remuneration for any manager involved in any of the Black Links divisional areas is decided internally by the connectors and Trustees and can be up to 50% of net revenue in. WTU Council: a consultative and decision making body, which represents members externally outside the co-operative. It is made up of the community leaders, business champions and role models of the black community who form a part of the organisation We The United (WTU) at wetheunited.com. WTU members have and continue to play a pivotal role in the past, present and future of Black Links. Recruitment to management is often sort from the WTU members. The WTU organisation and its members can derive revenue from Black Links activities and are a strategic partner organisation that provide and receive resources as a result. WTU members get to vote and impact on decisions made for the benefit of Black Links and its members. Connectors/Introducers Council: a consultative and decision making body, which represents members internally within the co-operative. It is made up of the people ( business owners) who help and earn in the growth, expansion and development of the Black Links and its 7 divisional areas. These people receive a generous reward for the part they play in connecting Black Links to its consumers and vice-versa, which can be up to 50% of net revenue in. This is in keeping with the ethos of giving back and encouraging business development. The Governing and Management Council look to connectors and their vote to make decisions within the organisation. Recruitment to management is often sourced from the connectors. Each connector can become a member of the Management and the Governing Council. The above organisational structure is fundamental to each Black Links land mass and country specific portal that services it. The benefit of each structure lies in its ability to interlink or connect with any other structure both at membership and organisational level worldwide. This interconnection is made possible through Black Links communication platforms that allows for one-to-one and conference/presentation calls visual and audio, recordable or live, worldwide and free to all 24 hr a day-7 days a week. This is unification. What happens next as a result of unification on a local, national and international level is that the opportunity to make use of the scale of economies is realised. 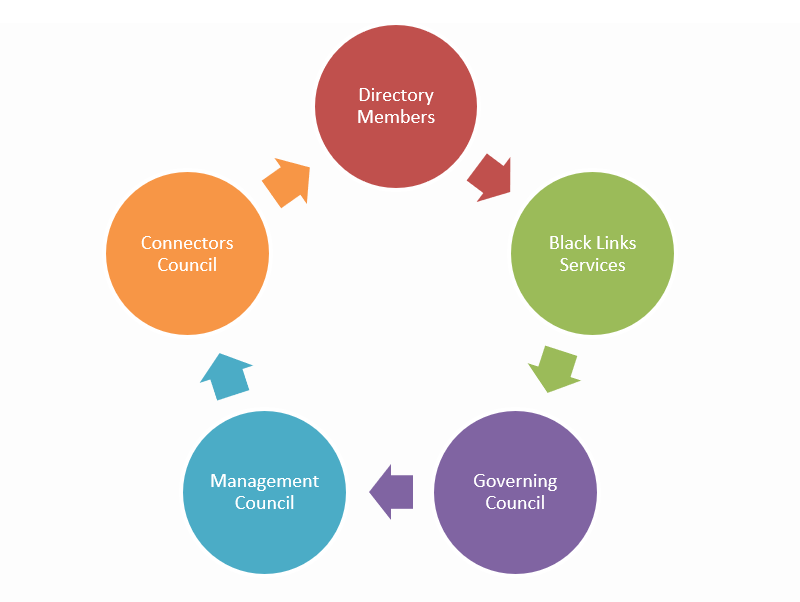 Black Links provides a Coordinating Council that acts under the Governing Council and provide a service in managing and administrating the work necessary in developing the organisational structure and regulatory compliance that enables affiliations, associations, joint ventures, acquisitions, mergers and take-overs to succeed.